A delegation led by Provost Liviu Matei visited Myanmar in January 2017. CEU was invited to take a leading role in assisting the Myanmar government and universities, contributing to the initial work of the new National Education Policy Commission, advancing the ambitious revitalization of the University of Yangon, and developing the national and institutional frameworks for quality assurance in higher education. A meeting with the Minister of Education H.E. Prof. Myo Thein Gyi, leaders of the Daw Aung San Suu Kyi Trust for Health and Education, and the founder and local representatives of the Open Society Foundations took stock of the productive partnership that goes back to 2012. CEU has become a key resource and partner for Myanmar universities in developing social science curricula, building capacity for research and teaching, and contributed to the development of concepts and planning of university autonomy. To date, CEU has hosted almost fifty Myanmar academics as Research and Faculty Development Fellows on its Budapest campus. Starting in 2017 CEU will engage closely with the University of Yangon Revitalization Committee in the areas of governance, management and planning, and raising the quality of academic programs, as the University of Yangon gears up to re-emerge as Myanmar’s first autonomous university and a strong higher education institution of national and regional significance. The discussions with the newly established National Education Policy Commission and the National Accreditation and Quality Assurance Committee centered around the practical issues of definition and implementation of university autonomy and development of policies and practices of quality assurance at the national and institutional level. CEU has been a key contributor to the debate on university autonomy in Myanmar since 2014, when it introduced a Practical Handbook on University Autonomy developed specifically for Myanmar and followed up with a series of capacity building activities. University autonomy has since become enshrined in the National Education Law and the new democratic government is developing specific steps and policies for gradual transformation of the centralized university system. The issue of autonomy of universities is linked to quality promotion and the development of quality assurance frameworks. Assisting in building capacity of the national policy bodies and universities in Myanmar in this area will be a strong focus of CEU’s supporting activities in the coming years. As the first practical step in this direction, CEU’s Yehuda Elkana Center for Higher Education has developed and conducted a national Workshop on Quality and Quality Assurance in Higher Education in Myanmar. 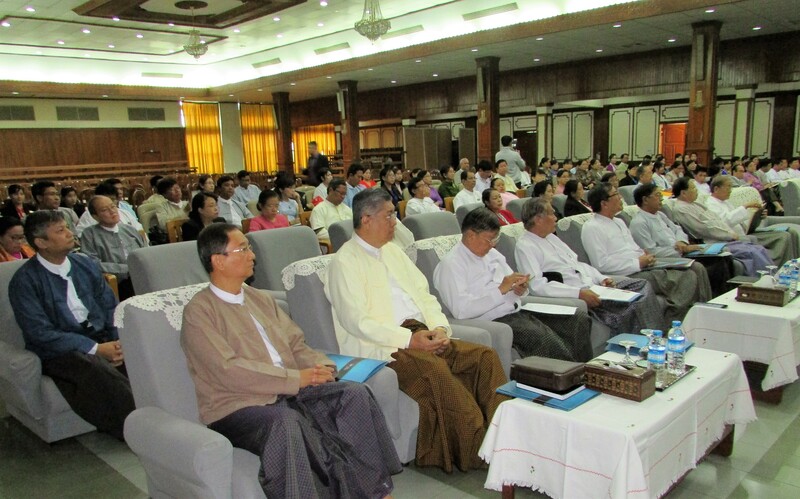 Held on 13-14 January 2017 in the Diamond Jubilee Hall in Yangon, under the auspices of the Ministry of Education and the National Education Policy Commission, the Workshop was attended by 120 participants representing the leadership of the Ministry, Department of Higher Education, the Commission and its constituent Committees, Rectors of over forty universities across the country and university staff involved in quality assessment. The Workshop introduced the Practical Handbook on Quality and Quality Assurance prepared by Liviu Matei, CEU’s Provost, and Julia Iwinska, CEU’s Director for Strategic Planning, which will serve as a resource in policy debate and capacity building. CEU assembled and led an international team of expert contributors to the workshop who brought in relevant perspectives and case studies from Europe, Asia and North America. Members of the team included: Lesley Wilson, Secretary General of the European University Association; Ian Holliday, Pro-Vice-Chancellor of the University of Hong Kong; Jacques Frémont, President of the University of Ottawa; Sauwakon Ratanawijitrasin, Professor at Mahidol University, Thailand, former Director of South-East Asian Ministers of Education Organization-Regional Centre for Higher Education and Development (SEAMEO RIHED), and Deputy Executive Director of the ASEAN University Network; and Ligia Deca, State Counselor at the Romanian Presidency, former Chairperson of the European Student Union and Head of the Bologna Process Secretariat. Higher education has been at the forefront of politics, ideological debate and social melee for most of the past seventy years of the history of Burma, now Myanmar. From the struggle for independence in the 1940s, through the Socialist turn of the 1960s, recurrent military takeovers, the controlled democratization agenda of the quasi-civilian government of the 2010-15 and to the landslide victory of the National League for Democracy lead by Daw Aung San Suu Kyi who, in 2016, formed the first genuinely democratic government of the Union in over five decades, universities remained the source of resistance and unrest lead by the students as well as a subject of scrutiny and efforts at centralization by successive governments. Student movement has been a major constituent in leading the struggle for democracy in recent decades, and the fighting peacock symbol of the Student Union of Burma has been adopted by NLD as its official flag. Perceived as a direct threat to the rule of the junta, the universities remained closed for almost a decade at the turn of the century. Myanmar’s higher education underwent a sharp decline from being a recognized regional leader, with the Rangoon University (established 1920, now University of Yangon) as its centerpiece breeding intellectual, cultural and political elite of South-East Asia, to becoming one of the most under-resourced and antiquated edifices among its peers. The new reformist government is facing a daunting task of modernizing and re-invigorating the country’s higher education, improving the quality and gradually decentralizing the system and granting universities autonomy and has enlisted CEU as one of the key partners in its efforts. CEU, with support of the Open Society Foundations, has been engaged with Myanmar universities since the start of the democratic transition in the country in 2012, when the reform of education sector was identified as a priority for national development. Our contributions to policy debate and to building academic capacity of the universities helped us build strong alliances throughout the sector, with the policy makers, scholars, administrators and student leaders, as well as with relevant civil society actors and international development partners. CEU has helped develop undergraduate specializations in Political Science at the Universities of Yangon and Mandalay and train about fifty faculty Fellows in research and curriculum development across the social sciences. Since late 2016, CEU’s Global Teaching Fellowship Program offers semester-long placements in Myanmar for one academic semester. In addition to increased scholarship support for Myanmar students enrolling in its Masters programs, in 2017 CEU is introducing new Fellowships for academics in the areas of social research methods, academic writing and information and digital literacy.